The History of Oil Must Include Spindletop and Howard Hughes. 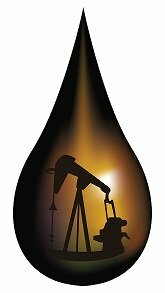 Spindletop is renown in the history of oil as the first oil well of any real significance. Because this discovery of black gold changed Texas history as well as global history. Before 1901, Texas history was merely one of rural, agricultural roots. However, the discovery of mass amounts of petroleum combined with drilling advances made by Howard Hughes to more efficiently remove it from the ground, thrust Texas history suddenly into the petroleum and industrial age. The gusher at Spindletop was drilled on January 9, 1901, near Beaumont, TX. 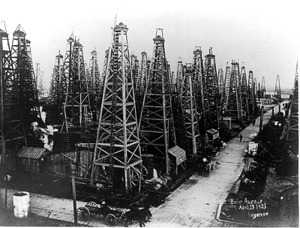 This oilwell was NOT the first attempt by man to harness the earth's petroleum. For instance, the first North American oil well was drilled in 1858 in Ontario, Canada, and one in the United States in 1859 at Titusville, PA to a depth of 69 feet. However, most people don't realize that the history of oil actually began in China in 347 A.D. At this time, the Chinese drilled for oil to depths of up to 800 feet. How? A type of drill bit was attached to the end of bamboo poles. Black gold was also known as "burning water" in the 7th century A.D. in Japan. Natural oil seeps were present in Texas for hundreds of years prior to the arrival of Europeans and had even been used by the Native Americans. Texas Indians are reported to have told the Europeans that the black gold had medicinal uses, and Spanish explorers reported having seen petroleum floating on the surface of waters and used it to caulk their boats. Around 1899, Austrian mining engineer, Capt. Anthony F. Lucas answered an ad placed by Patillo Higgins for a new partner. Lucas and Higgins believed that Spindletop Hill was a large salt dome and might contain oil and sulphur. Higgins had noticed oil seeps and gas flares on the hill while taking his Sunday school class on picnics. With the help of Al and Curt Hamill, Lucas began drilling in 1900. After several months of disappointment, the discovery that would change the course of Texas history was made - the Spindletop gusher! 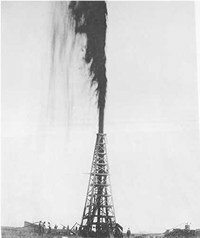 Spindletop gushed for nine days before it could be capped and spewed black gold 150 feet in the air. Three months later, five more gushers had been drilled. These six wells produced more than oil in a day than the entire world and changed man's perception of petroleum more than any other even in the history of oil. Within just a few months, more than 50,000 "oil boomers" flooded Beaumont. Wooden derricks filled the skyline as far as the eye could see. Men seeking work filled Beaumont and slept on the streets if they couldn't find an available bed. The most infamous spot in Beaumont was Grinnell's Log Cabin Saloon. Legend has it that someone was killed at Grinnell's every Saturday night. Not unlike the California Gold Rush, the rush for Black Gold was on - this time in Texas. But pick axes and gold pans were replaced with drill bits and derricks. The history of oil was being written. Salt domes attracted the attention of speculators worldwide. Companies were formed to seize and capitalize on the stampede to obscene wealth and riches. Most of the major oil companies today were flung into existence with the news of Spindletop: Texaco, Exxon, Mobil and Sun are a few. Amongst all these entrepreneurs and businessmen, one man cannot be left out of the history of oil and drilling - the infamous Howard Hughes. Thanks to this man, today's world of oil and gas exploration includes sophisticated advances like directional drilling and offshore oil drilling. The fishtail bit (or drag bit) was successfully used on the Lucas well at Spindletop but was unable to drill loose formations and those prone to caving. Thus, drilling was limited to reservoirs near the surface. Not only were fishtail bits limited to shallow drilling, they were also slow, drilling at rates as low as 2' per day. In 1908 Mr. Hughes and his partner, Walter Sharp, built a wooden model of a roller type bit and tested it in Goose Creek, TX. Their concept was not to rely on scraping the rock like a fishtail bit but to chip, crush and powder hard rock formations utilizing cones that rolled in a true circle. The cutting edges were designed to prevent the cuttings from falling into previous cuttings, thereby preventing tracking. This rolling motion enabled the bit to constantly crush and grind new rock with each turn. The experiment was a huge success! They immediately founded Sharp-Hughes Tool Company in 1909, with Howard Hughes ending up with complete ownership in 1915. The company then became known as Hughes Tool Company. With Howard's death in 1924, his son, Howard Robard Hughes dropped out of Rice University to manage Hughes Tool Company. 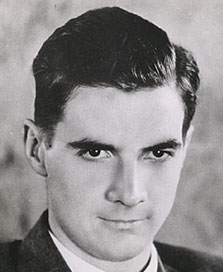 Howard Hughes, Jr., sold Hughes Tool Company in an initial public offering in 1972. In 1987, Hughes Tool Company merged with Baker International and became known as Baker Hughes. With the acquisition of Eastman Christensen, Baker Hughes merged Eastman Christensen with Hughes Tool Company. This became known as Hughes Christensen Company in 1992. Not enough can be said about contributions to drilling made by Howard Hughes. His contributions forever changed the history of oil and drilling as mankind has become completely dependent on crude. One hundred years later, all major drill bit manufacturers still follow the basic concept of the Sharp-Hughes two cone drill bit. The contributions of the two-cone drill bit has been so immense that The American Society of Mechanical Engineers has designated the Hughes Two Cone Drill Bit a Historic Mechanical Engineering Landmark.